Irit Goffer-Sasson, the founder and designer of Amaro, identifies herself as a mother and woman, proud that she has turned her design talents into a business that supports many, many other women and families. Her jewelry is made in Israel, featuring plated metal settings and chains, colored with gemstones and crystals, so you have natural loveliness mixed with bling. This bracelet is set in metal plated a rose gold color, warm and inviting. Settings span 6 inches, joined with flexible links to curve gracefully around the wrist, closing with lobster clasp at 7-1/4 or 7-1/2 inches. 3/8 inch wide. The colors are shades of vibrant fuchsia pink, lemon-lime olive. The stones include jade, pink abalaone/paua shell, amethyst, and Swarovski crystals. Earrings set in metal plated a rose gold color, warm and inviting. 1-3/4 inches long with post (plated also), Swarovski crystals sparkle in fuchsia pink with lemon-lime jade. Earrings set in metal plated a rose gold color, warm and inviting. 2-5/8 inches long with post (plated also), Swarovski crystals glint from starburst oval, along with graceful mother-of-pearl drop. This necklace has an expensive feeling and look. The metal is plated in rose gold color, warm and inviting. Settings span 10 inches of front, joined with flexible links along top edge to curve gracefully. 3/8 inch wide. The colors are shades of vibrant fuchsia pink, lemon-lime olive. The stones include jade, pink abalaone/paua shell, amethyst, and Swarovski crystals. Lobster clasp, can be closed 14-19 inches long. Earrings set in metal plated a rose gold color, warm and inviting. 2-5/8 inches long with post (plated also), Swarovski crystals in fuchsia pink glint from starburst oval, along with graceful olive jade drop. Earrings set in metal plated a rose gold color, warm and inviting. 1-3/4 inches long with post (plated also), Swarovski crystals sparkle with cats-eye and rose quartz. Earrings set in metal plated a rose gold color, warm and inviting. 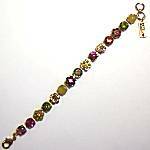 1-1/2 inches long with post (plated also), Swarovski crystals sparkle in fuchsia pink and olive green. Earrings set in metal plated a rose gold color, warm and inviting. 1-4/4 inches long with plated leverback earwire, Swarovski crystals sparkle with cats-eye.